Camping Oyam is a modern, stylish and friendly 4 star campsite that occupies a fantastic position on the outskirts of Bidart but within close proximity to the wonderful Atlantic coast and the beaches that line the shore. The lovely landscaping and modern facilities really give you a sense of luxury whilst still promoting a friendly atmosphere. There are lots of activities available both on site and nearby and the campsite has also teamed up with a surf school in nearby Biarritz to offer discounted courses. Bidart is a lovely seaside resort that’s considerably less busy than its neighbour Biarritz. Both are fantastic places to visit with everything you could possibly want whilst on holiday, from shops, to bars and restaurants that sell locally made produce. The closest beach to Camping Oyam is at Bidart around 1km away. Easily reached by foot, bicycle or car the beach is quite large and offers plenty of space to relax or play games and surfing and bodyboarding are also quite popular in the area. 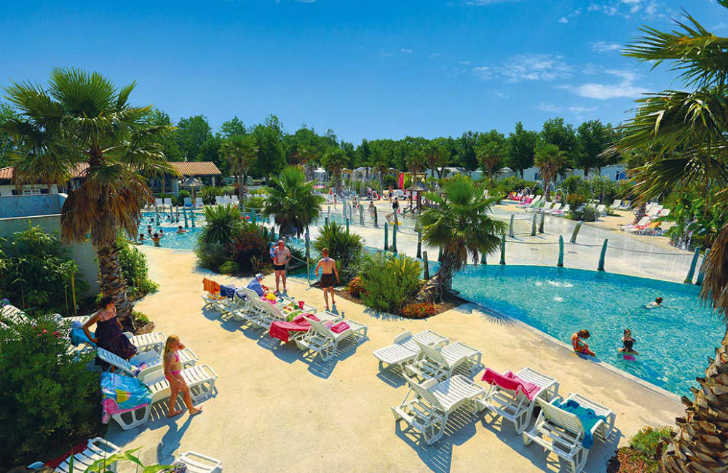 Camping Oyam not only benefits from having a fantastic beach nearby but also boasts a really nice swimming pool complex which offers a heated family pool, heated children’s pool, water slides and a fantastic spray park for kids. Camping Oyam campsite offers a comprehensive selection of activities and facilities on site and also nearby to ensure you have a fantastic family holiday. On-site activities at Camping Oyam campsite include a multi sports pitch, football, volleyball, basketball, table tennis, boules and a playground area. Facilities available at Camping Oyam campsite include WIFI, takeaway, restaurant, bar, groceries, animation team, washers and dryers. Accommodation at Camping Oyam campsite includes a range of 2 and 3 bedroom mobile homes that are available from Canvas Holidays .